You are currently browsing the Bookmobile News weblog archives for March, 2011. Ever since upgrading our service to the new vehicle back in November, we’ve been wondering how to put the old Free Bookmobile trailer to best use. Fortunately, super-volunteer June Michaels was in touch about a plan to install it at Landpaths’ Bayer Farm in southwest Santa Rosa. As described on the website, “Bayer Neighborhood Park and Gardens is a unique collaboration between Santa Rosa Recreation & Parks and LandPaths. It is a 6-acre urban farm & city park-in-the-making in the heart of the Roseland neighborhood, 2 miles from Downtown Santa Rosa, with old barns, community gardens, and plenty of ways to relax and have fun.” And now, thanks to June, the Santa Rosa Friends of the Library, and the Free Bookmobile team, one of those ways to have fun will be to browse and take home great books! We have always enjoyed our previous visits to Bayer Farm to distribute books, including a terrific collaboration with Carnival of Chaos as part of the ArtsSonoma festival last year. It seems a perfect home at which to set up the old trailer, the interior of which is known affectionately as the “Kids Club” because children of all ages can crawl in to browse the shelves in perfect literary coziness. Fortunately Landpaths management agrees, and we will be working closely with Outreach Coordinator Magdalena Ridley to deliver a fully stocked mini-library to the farm as soon as the ground dries enough to drive it into place. We are just thrilled that the families in this low-income neighborhood will have continual access to high quality free books, and that this long-term loan of facilities will essentially double our presence in the county. It helps address one of the most serious problems created by recent cuts to education: access to literacy materials. The Free Bookmobile will continue to seek creative solutions to this problem, and we welcome your support. It’s hard to get through a week of news without hearing of yet another cut to literacy resources for children. One of the latest decisions announced (http://www.pressdemocrat.com/article/20110310/ARTICLES/110309425) will slash six librarian positions from the Santa Rosa City Schools roster. At the Free Bookmobile, we are saddened that the trustees are forced into the position to make these tough calls – it can’t be easy to find $3 million in savings. And yet we wonder how much leverage will be lost with these cuts. When you help and encourage a child to read, you set them on a course they can broaden themselves, as they mature and are able to understand more of the world’s discourse. A little access early in life can lead to engagement and participation later on. This is participation we need. There is much to be done to strengthen our communities and we need all hands on deck. We are also keen to make visits directly to schools with fewest resources. Last week, in partnership with the United Way and California Parenting Institute, the Free Bookmobile made an evening trip to Taylor Mountain Elementary School in south Santa Rosa, to provide books to low-income children and their parents taking part in a Literacy Fiesta. Though weekday events are usually a challenge for the volunteer Free Bookmobile staff, we look forward to shifting more attention to the growing need in schools and pre-schools. More later on our plans to make that happen, and in the meantime, please bring us all your children’s and young adult books that are just sitting around! We’ll get them into new hands and eager young minds. For me, there are few greater pleasures in this life than being part of the growth of the next generation. And so it was as I received an invitation to come speak to the 5th and 6th grade students at Santa Rosa Accelerated Charter School in Rincon Valley. Teacher Leslie Loopstra had read about the bookmobile and proposed to not only ask if I could come show the kids the vehicle, but to take immediate action on our behalf. Before I knew a thing about it, the children, their families, and the staff at SRACS started a book drive and held a bake sale to benefit our service. This is education of the highest caliber – raising awareness of what is really happening in our world and then organizing significant, constructive participation in it. The kids ran excitedly out in their fuzzy slippers to greet me (this was both their Read Across America Day AND Pajama Day) as I drove in. An assembly was called and it was my distinct honor to speak to over 100 students about the story of the bookmobile and community service in general. One girl held up a book of Grimm’s Fairy Tales she had found on our shelves the previous weekend at the Health Fair. Several students surrounded me after the talk to describe how much they love to read. All of them got a chance to come on board and check out the bookmobile interior. Comments included “This is soooo cool!”, “I want to live in here forever”, and “Man, you could make this into an awesome taco truck!”. As I prepared to depart, they presented me with bags and boxes of fantastic children’s books, as well as $281 their families had raised selling cookies and brownies! Just what we need most as we prepare for expansion of services: books for little ones and funding for our outreach operations. Huge thanks to the SRACS community for these gifts, and indeed, for the best gift of all, the opportunity to be involved in the students’ education. When considering our vehicle upgrade options, we kept high in mind access for persons with physical challenges. Our previous layout was very friendly to those in wheelchairs and walkers – they could move amongst the rolling carts with ease, and the trailer side-window shelves seemed to be at a useful height. 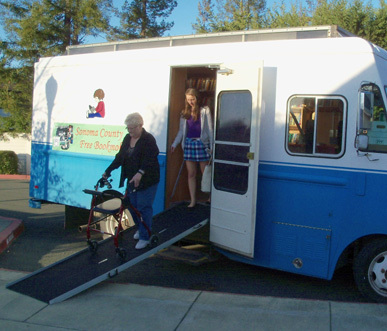 Some of the bookmobiles on the used market feature powered wheelchair lifts and in fact we came close to making a deal on one. Fortunately that fell through because we ended up with a much better overall rig, one that should serve the people of Sonoma County effectively and efficiently for many years to come. And thanks to funding from First 5 Sonoma County for modifications, we were able to outfit it with an access ramp. Mobile ramps strike a balance between weight, strength, and length. The heavier and longer the ramp is, the more difficult it is to handle and store. It must be strong enough, however, to support someone in a bulky wheelchair plus an attendant at the same time. It must also be long enough to provide a reasonable slope up into the vehicle. Our top stair terminates at about 28″ off the ground, so this is not a trivial consideration! We settled on a 2-piece LiteRamp in a 10′ length and our initial deployments have worked out well. At our first trial in Cotati, we came to appreciate the non-skid surface, which several patrons in walkers utilized as they slowly made their way down the ramp, applying their brakes to steady the descent. Then we scheduled a day of visits to senior residences exclusively. Again the ramp proved trustworthy, as at one point two helpers kept a person in a wheelchair slow and straight coming down. The three of us plus the chair must have weighed at least 600 lbs, well within the weight limit, and it was smooth sailing. While inside the bookmobile, the chair passed easily down the corridor between the children’s benches. Of course some of the shelves are a bit high for seated browsing, so we are always on-hand to assist with that part, too. We had one more milestone in store for us that day. From an assisted-living facility in Healdsburg, a 103-year-old woman with a walker made her way independently up the ramp to look for large-print books. Thanks to our wonderful community donors, we had several in stock to offer her!